Marco Merolla has been appointed Free Standing sales director of Whirlpool Italia. Graduated in Business Administration at the University of Naples, he began his career in Red Bull as District sales manager before moving to Galbani where he took on roles in the marketing and sales division as Senior brand and category manager. After an experience as a marketing manager in Bialetti, he joined Indesit Company becoming Head of product marketing Laundry; in 2015 in Whirlpool he was appointed director KitchenAid MDA and then became the marketing director of Whirlpool Italia in 2017. “I have the pleasure of congratulating Marco on this professional growth. 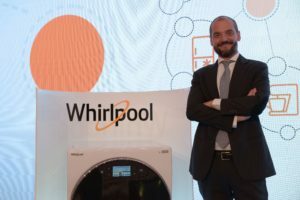 His appointment represents an important step in Whirlpool Italia’s strategy and I am sure that thanks to his experience, to the deep knowledge of our reality and the business in which we operate, he will be able to guarantee continuity and a new impulse to the Commercial Division”, commented Paolo Lioy, general manager of Whirlpool Italia.